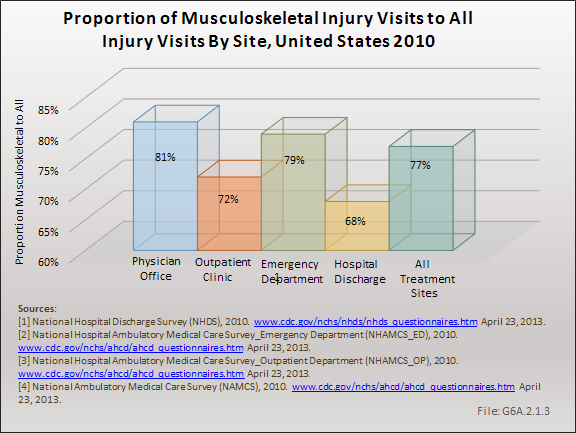 In order to compile a complete picture of the impact of musculoskeletal injuries, six major health care databases are used to estimate the number of visits to a health care provider in a specific year. 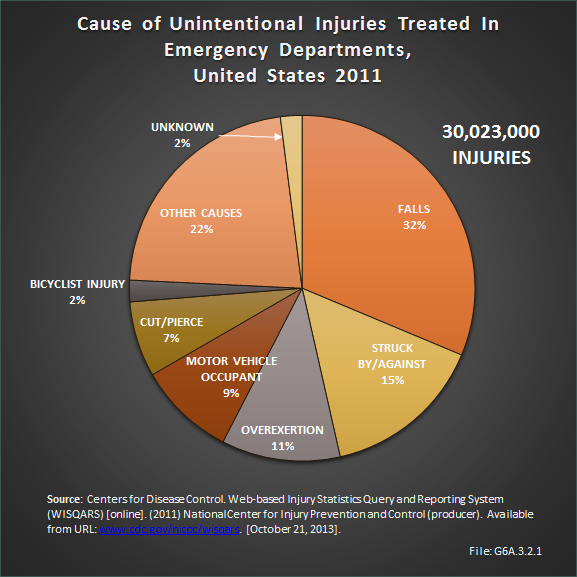 Treatment episodes, for purposes of this study, have been defined as the accumulative total of cases for all diagnoses treated in physician offices, emergency departments, outpatient clinics, and hospital discharges. 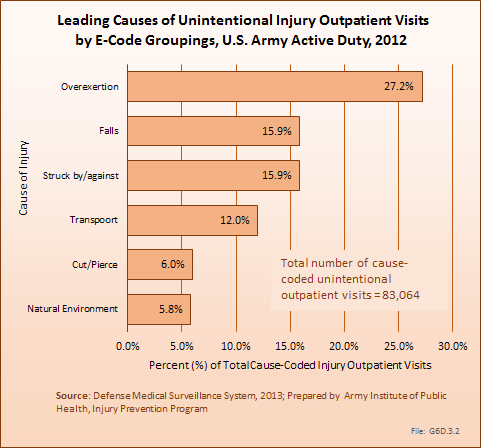 Diagnoses are based on variables within publicly available health care database that identify diagnoses or treatments based on ICD-9-CM codes submitted by health care providers. 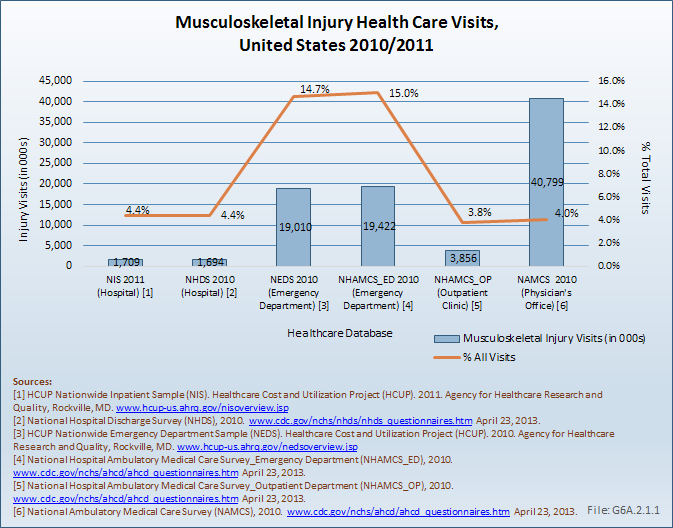 Databases used include from 3 to 25 diagnosis codes, or variables, per record. 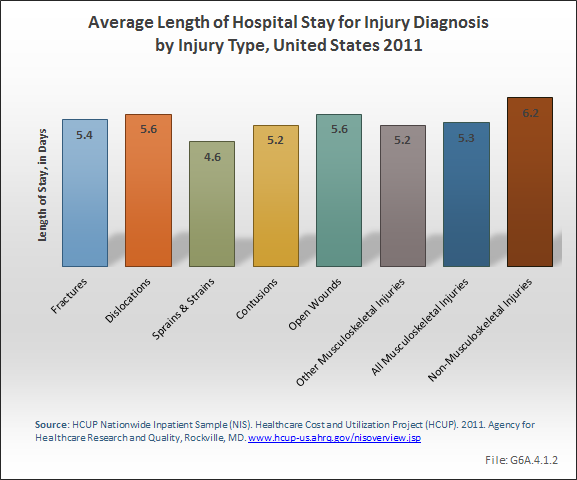 When analyzing the databases for a specific diagnosis or procedure, if any of the diagnosis variables in the database matches the code of interest, it is included in the total count. 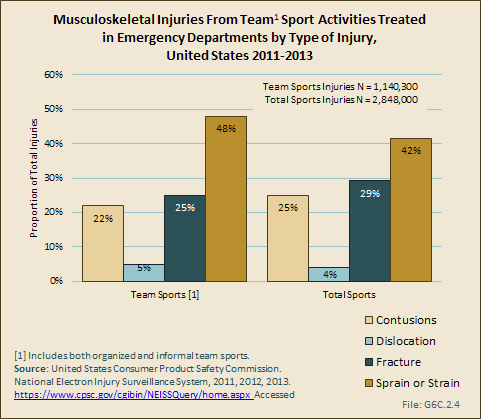 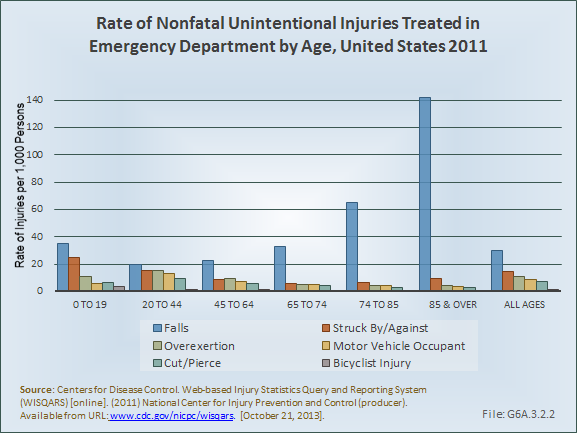 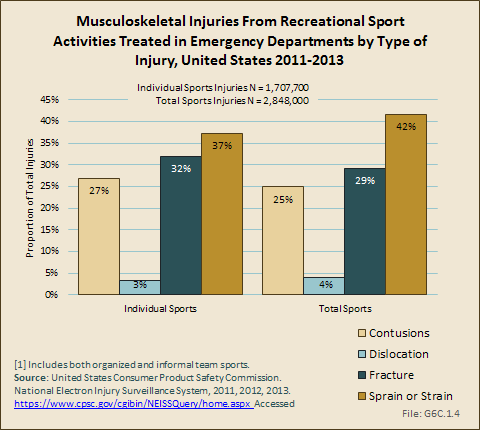 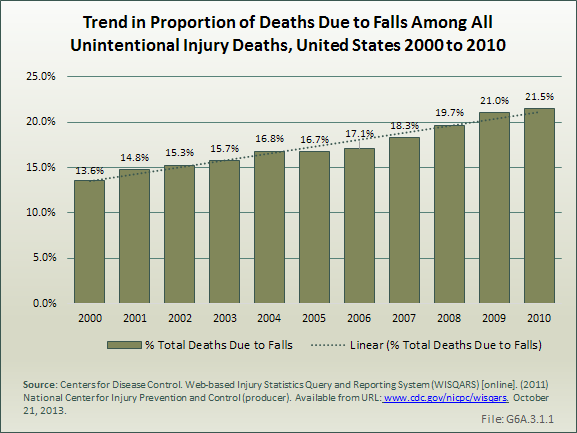 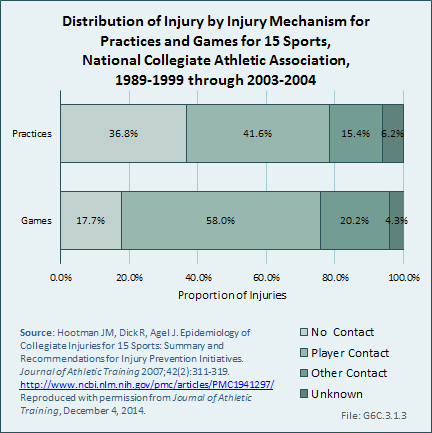 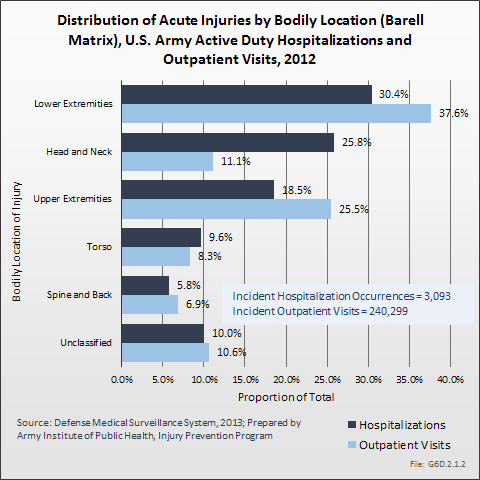 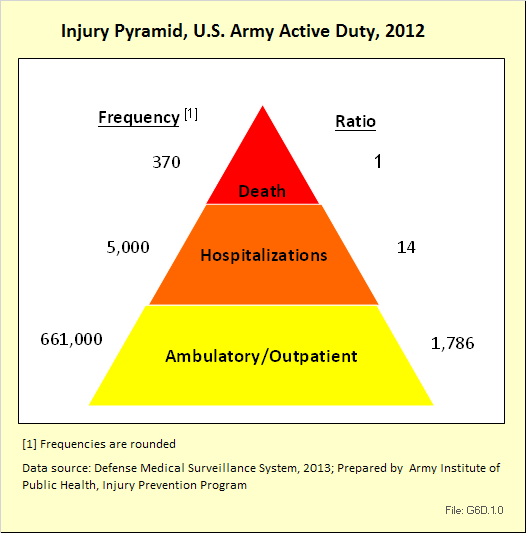 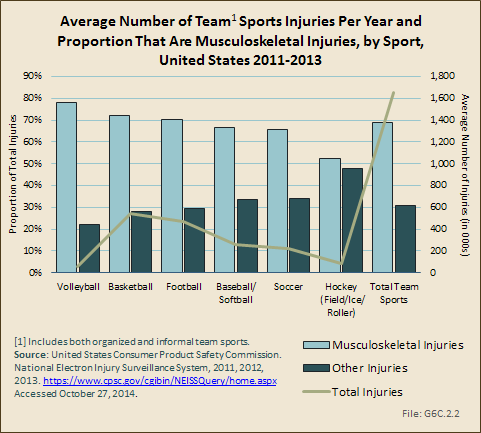 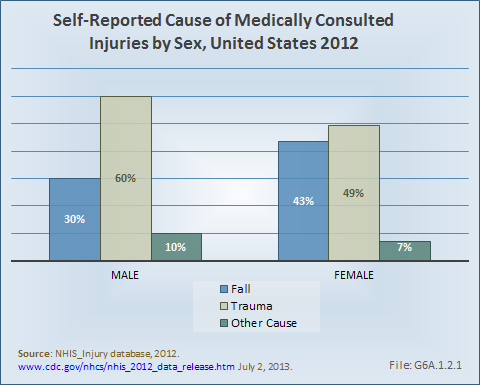 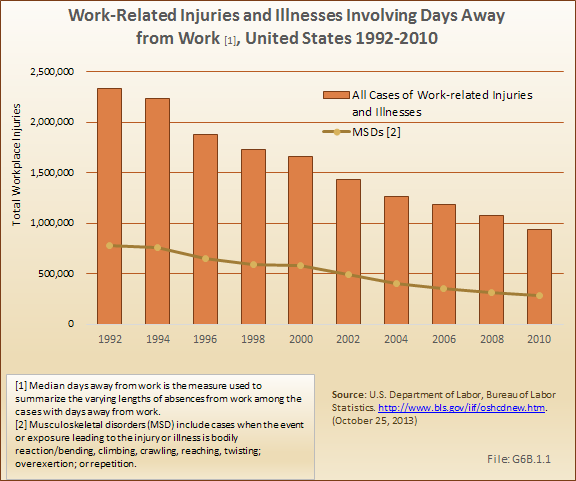 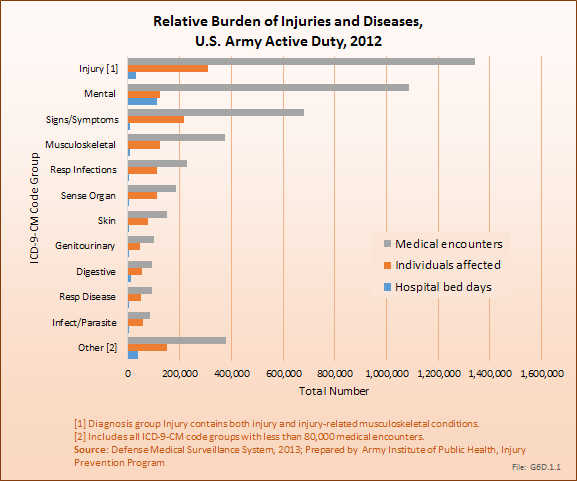 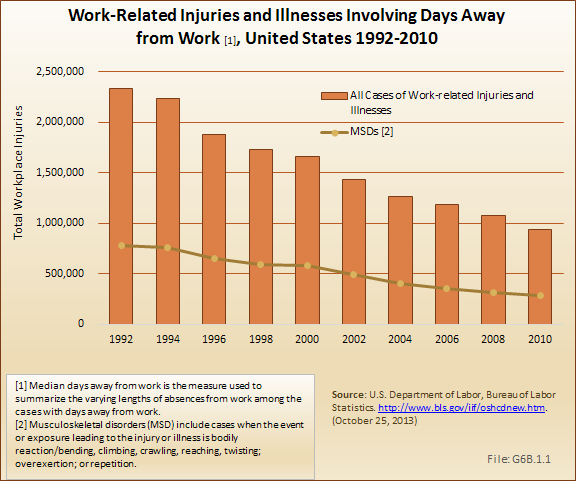 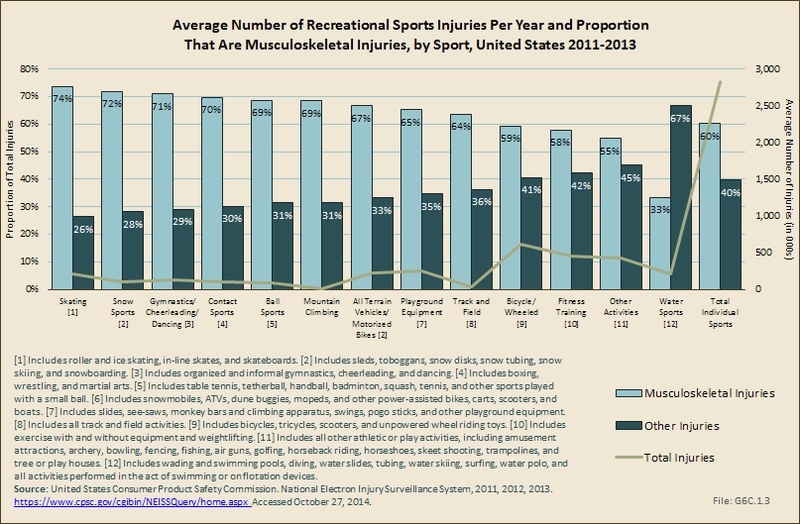 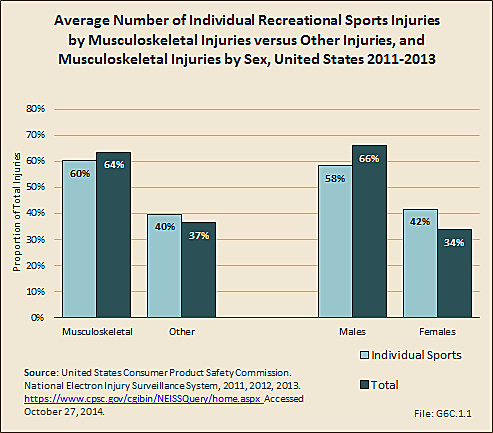 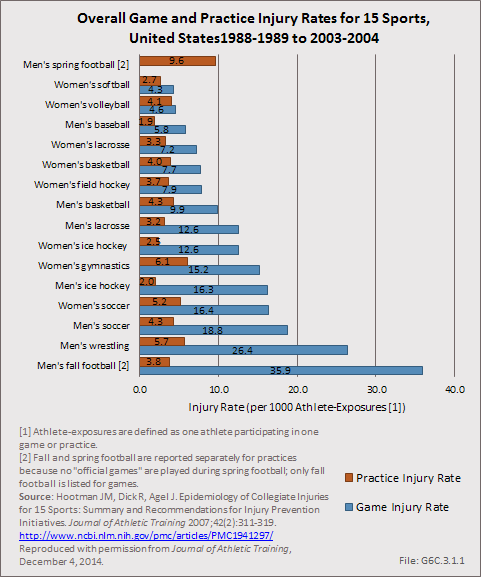 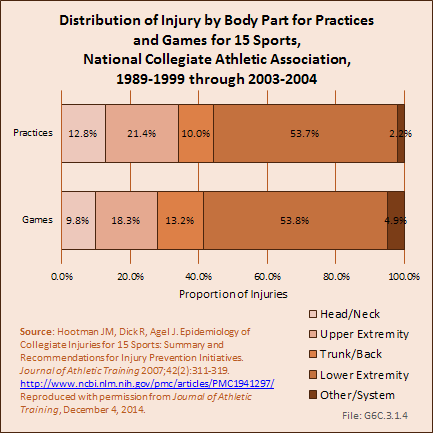 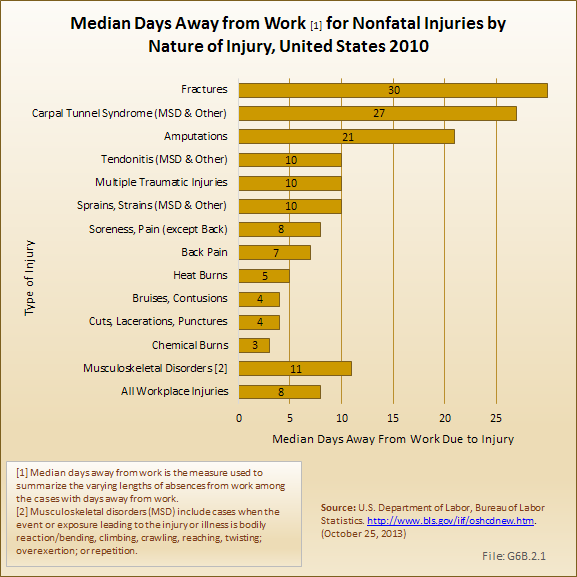 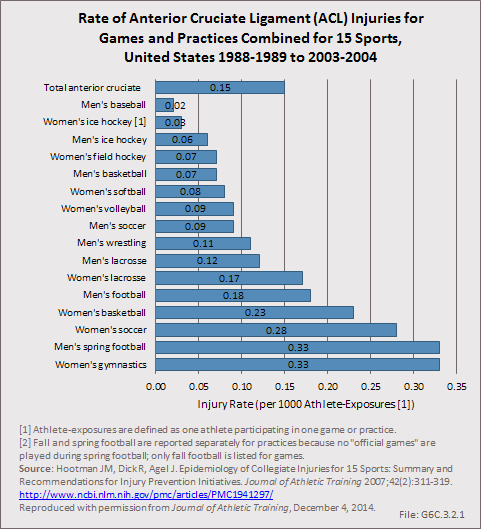 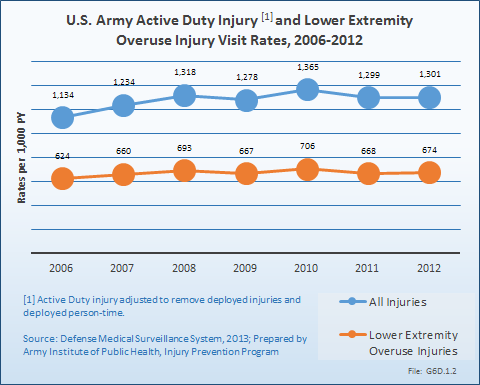 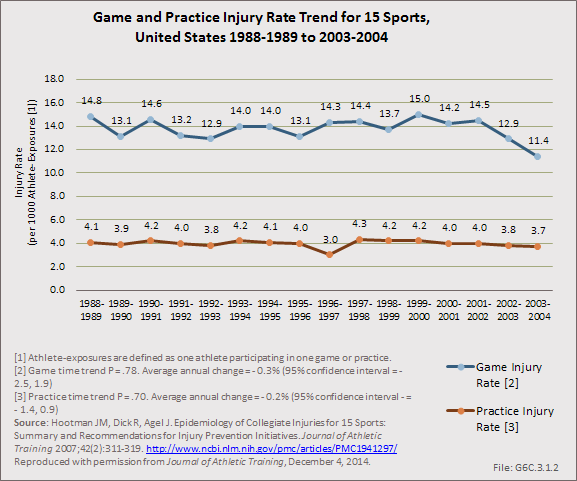 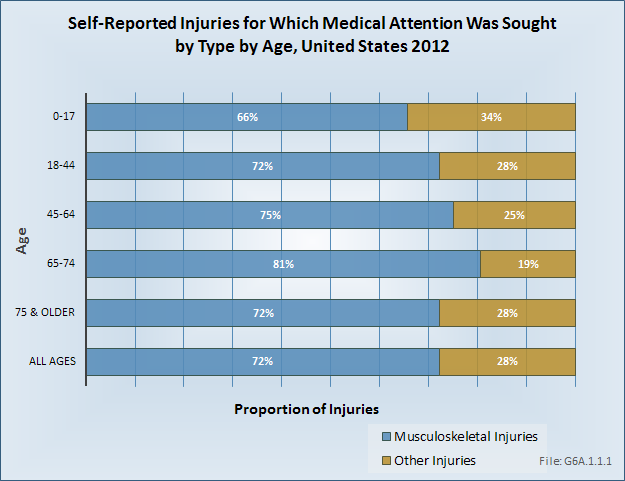 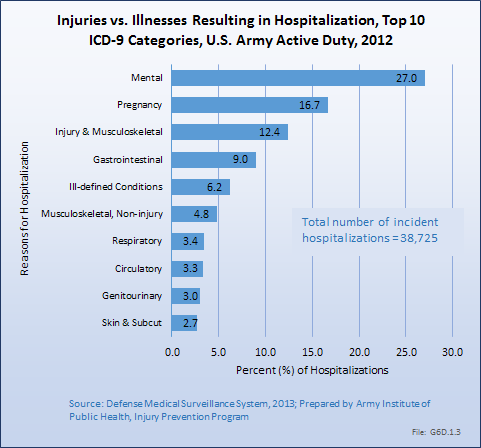 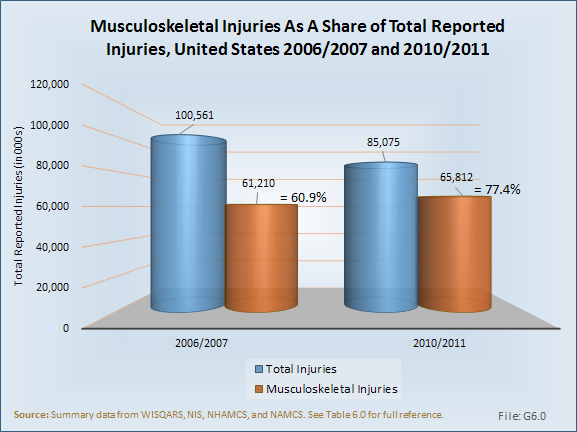 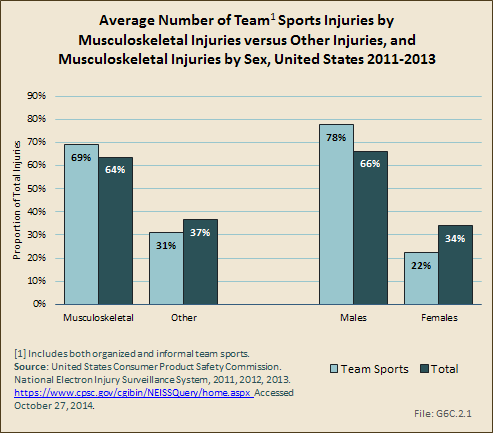 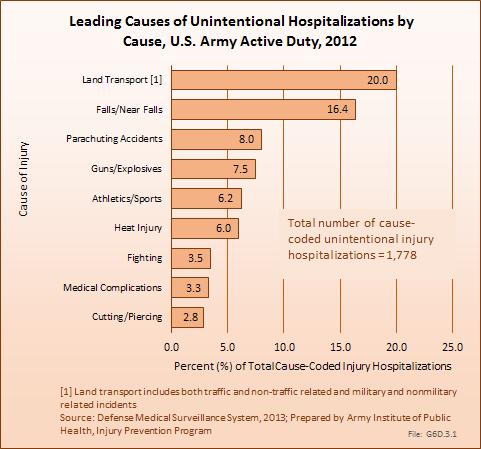 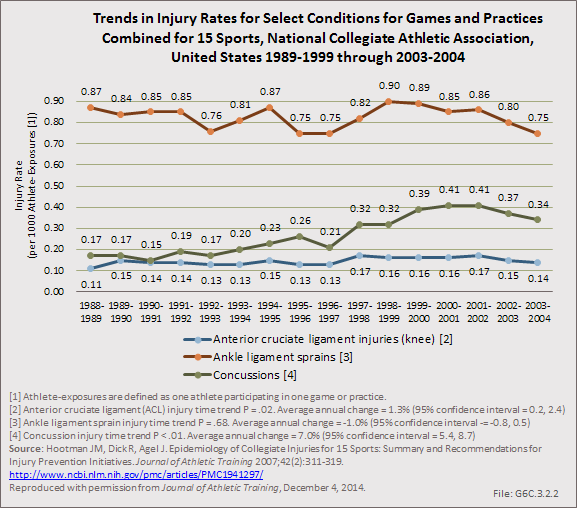 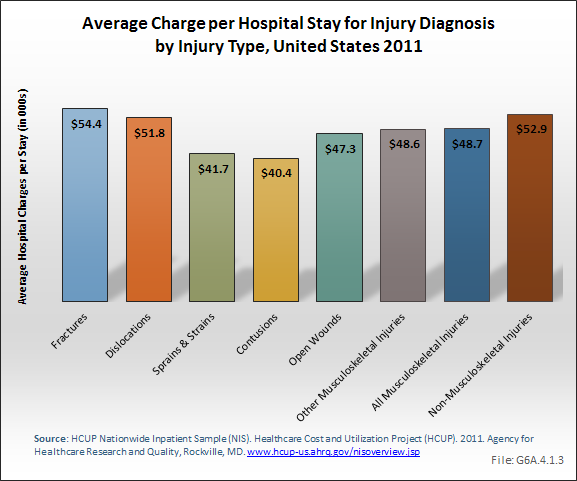 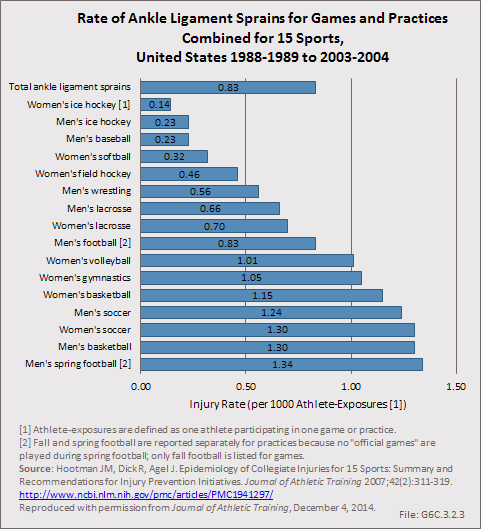 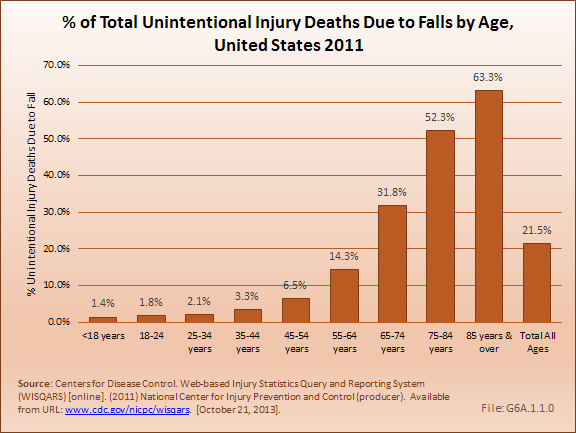 Hence, total numbers of injuries may exceed total records if more than one injury is sustained. 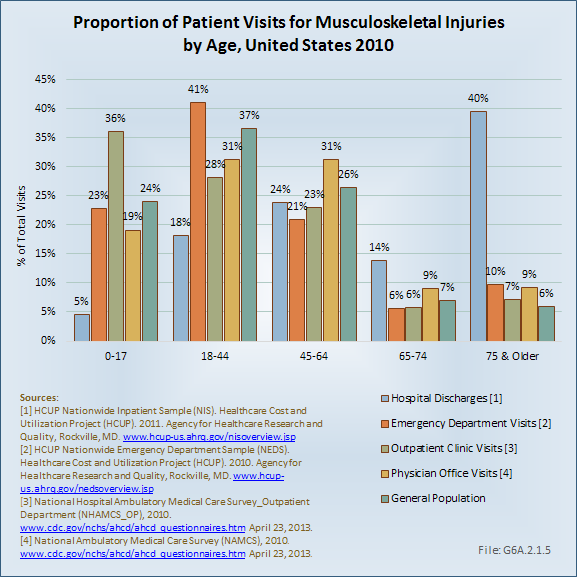 In addition, health care visits, or episodes, are not the equivalent of patients, as there is some unknown probability that a person may have multiple visits over the year included in the database. 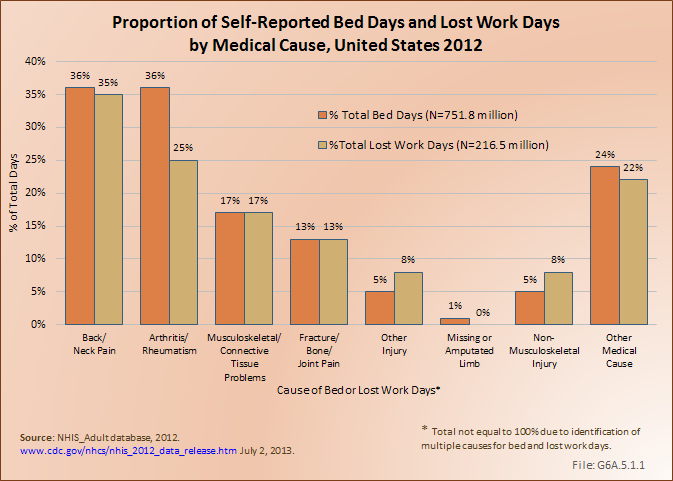 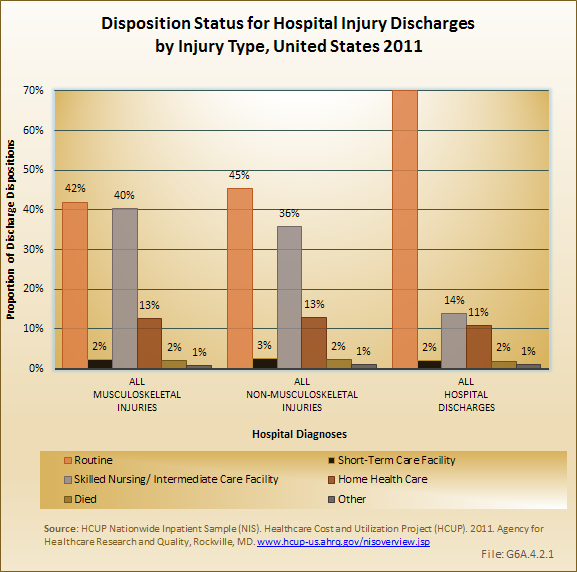 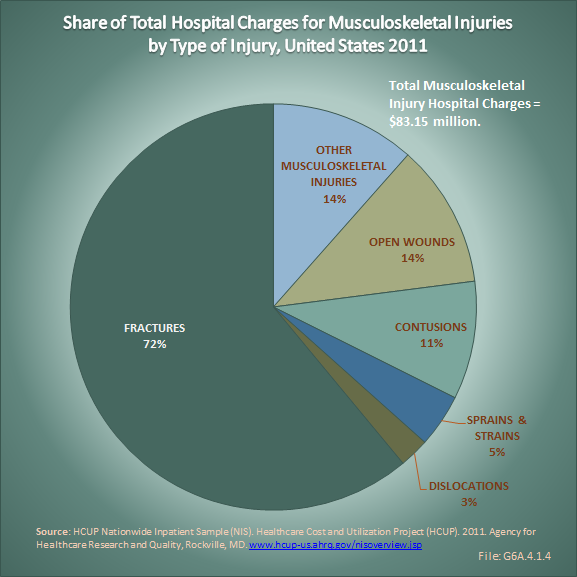 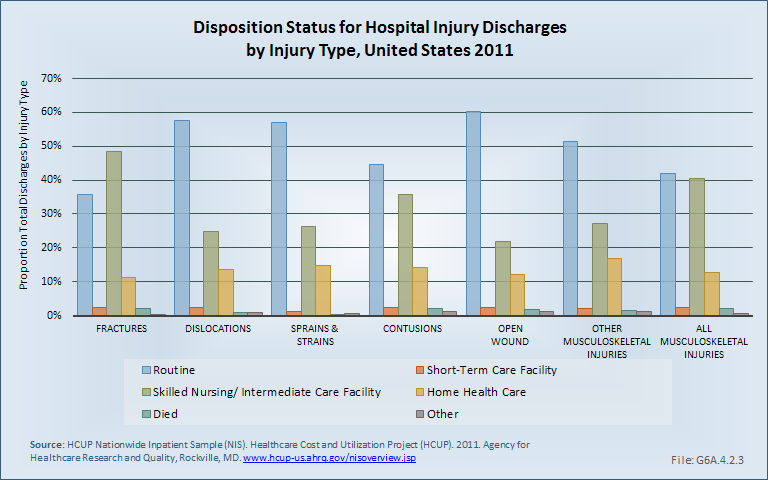 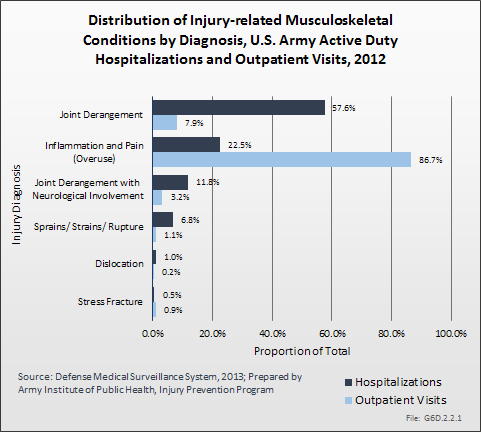 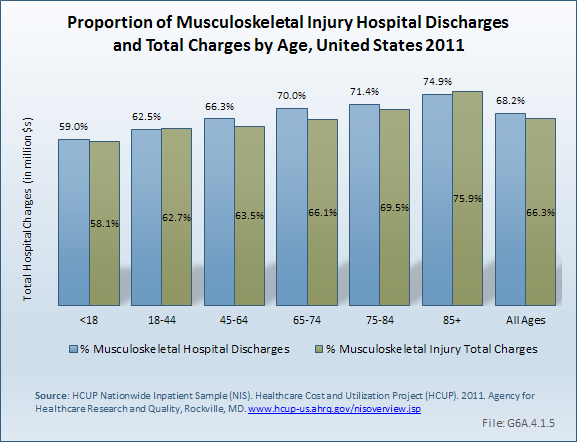 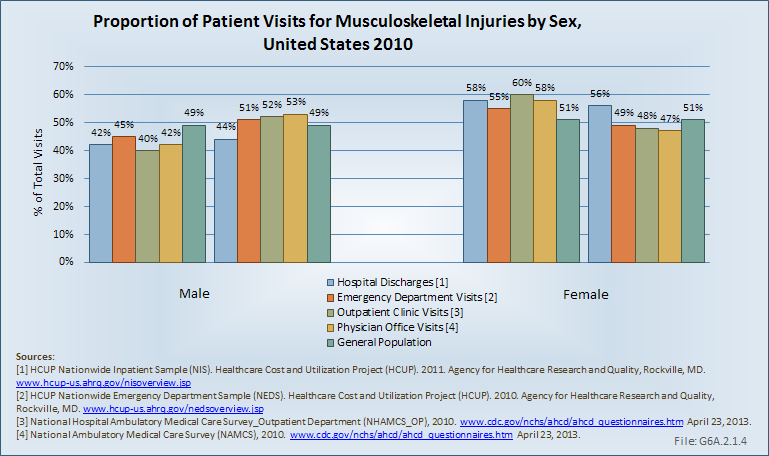 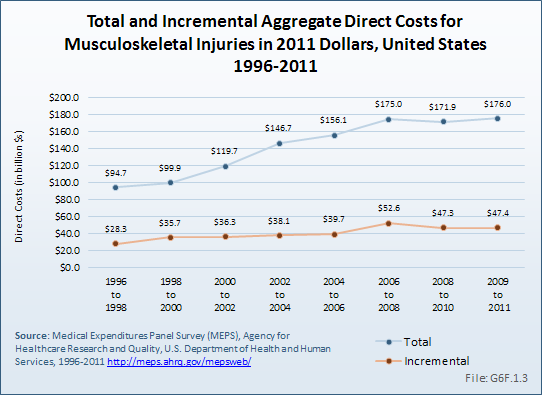 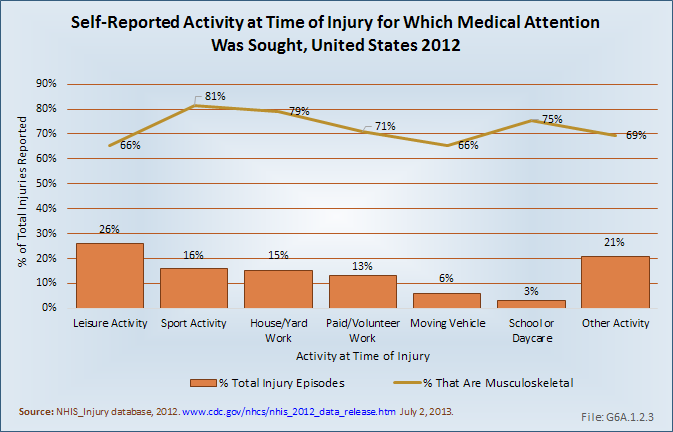 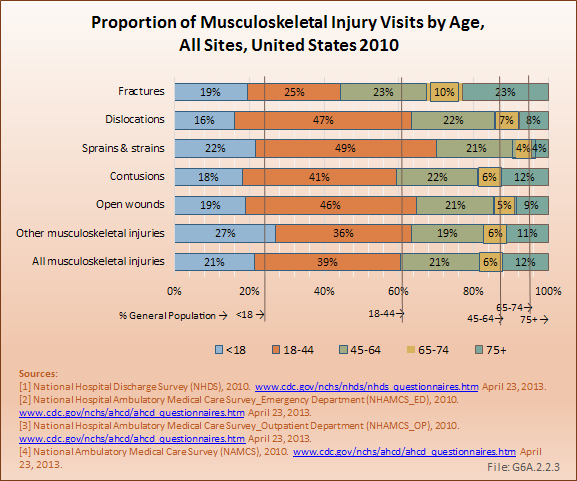 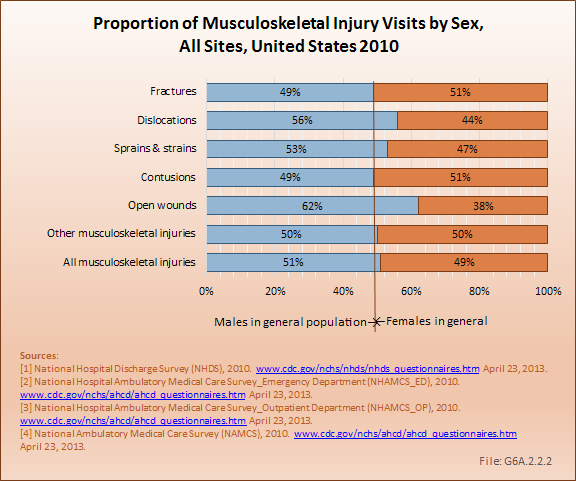 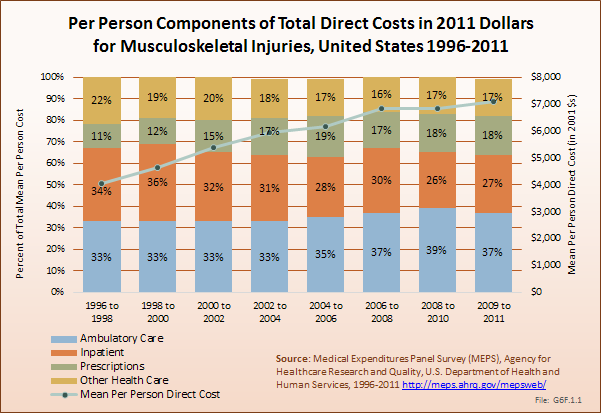 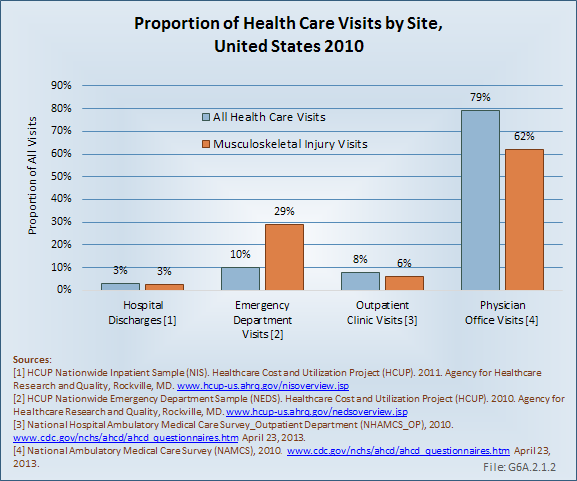 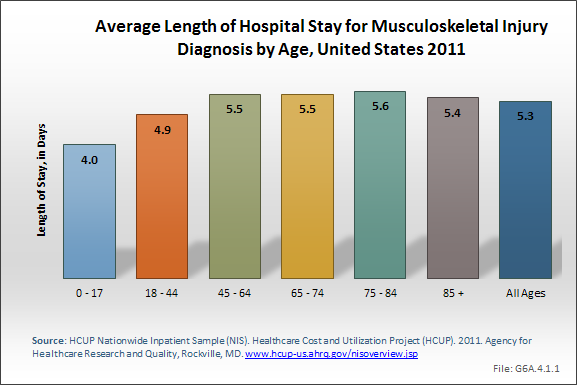 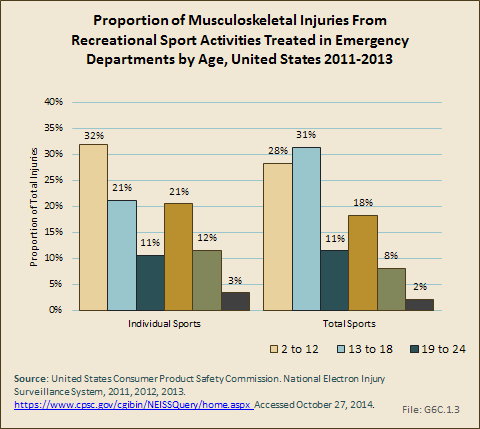 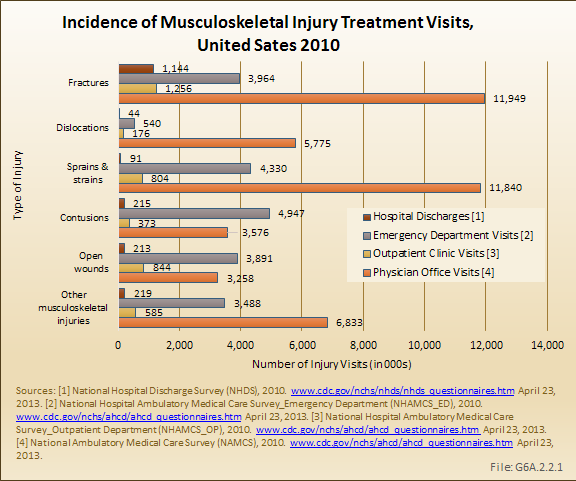 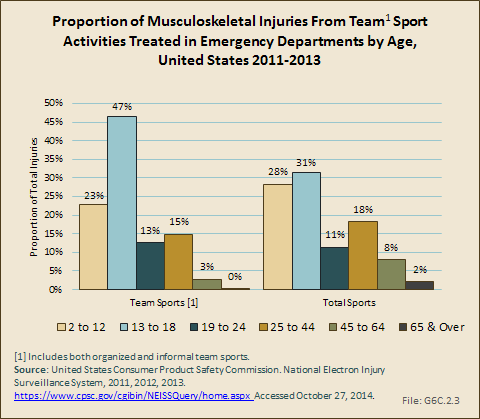 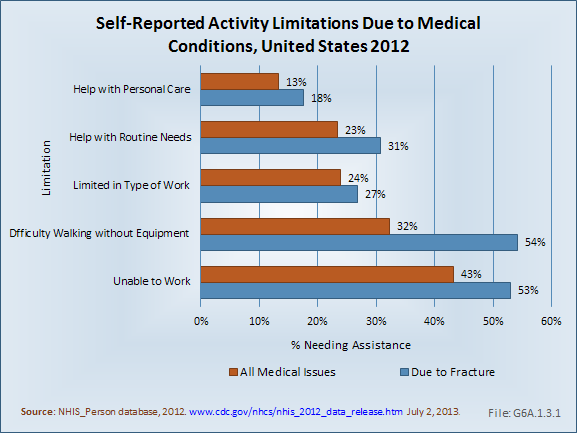 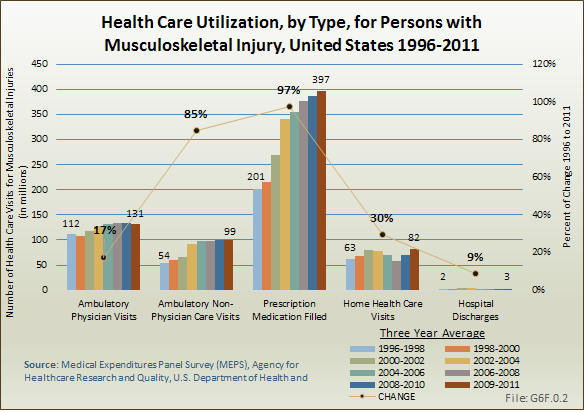 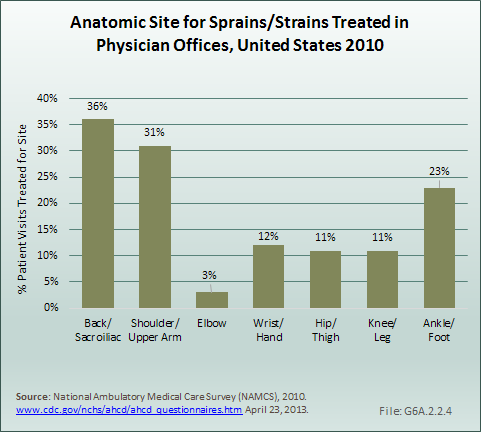 While not an absolute, the numbers presented are a solid estimation of how a particular health care issue such as a musculoskeletal injury, compares to other health care issues. 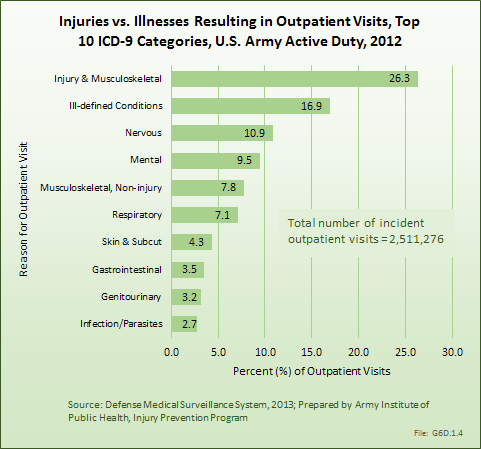 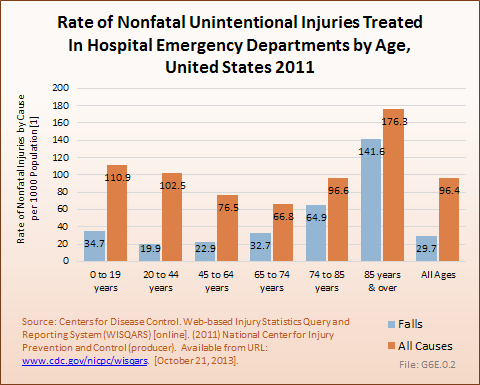 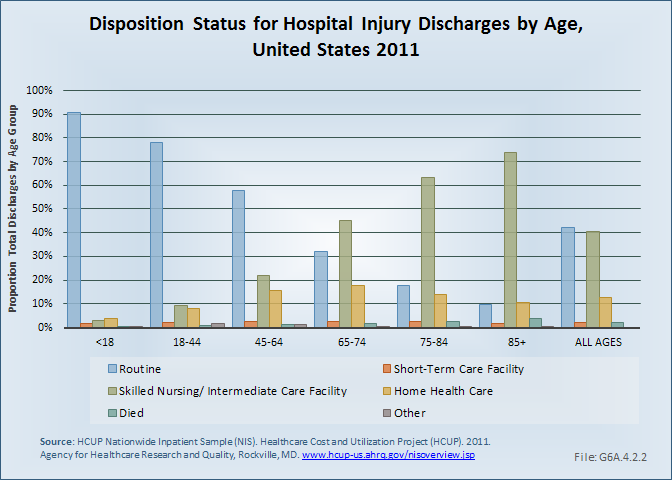 Four of the databases included are produced by the National Center for Health Statistics (http://www.cdc.gov/nchs/index.htm ), a division of the Centers for Disease Control and Prevention, and include data on visits to physician offices (NAMCS), emergency departments (NHAMCS_ED), outpatient clinics (NHAMCS_OP), and hospital discharges (NHDS). 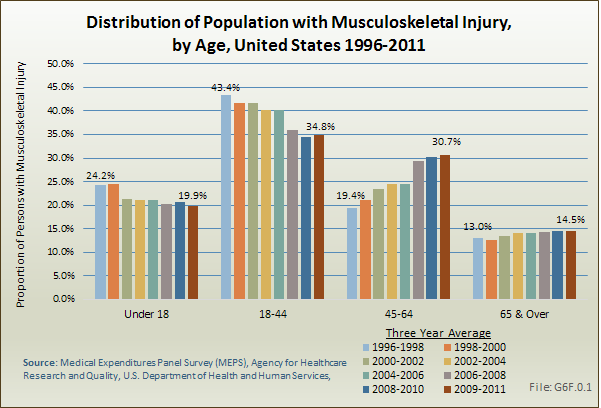 These four databases include a representative sample that is weighted to reflect the U.S. population by demographic characteristics for the year from which the data is produced. 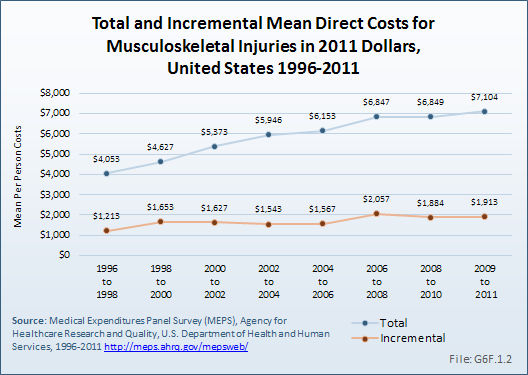 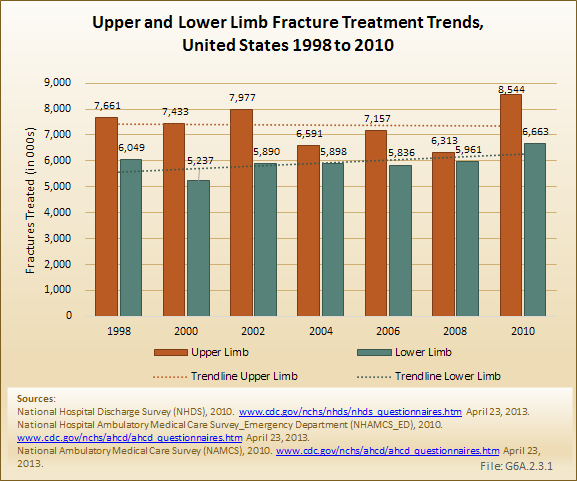 The remaining two databases are produced by the Healthcare Cost and Utilization Project (HCUP: http://www.hcup-us.ahrq.gov/ ) under the U.S. Department of Health and Human Services Agency for Research and Healthcare Quality. 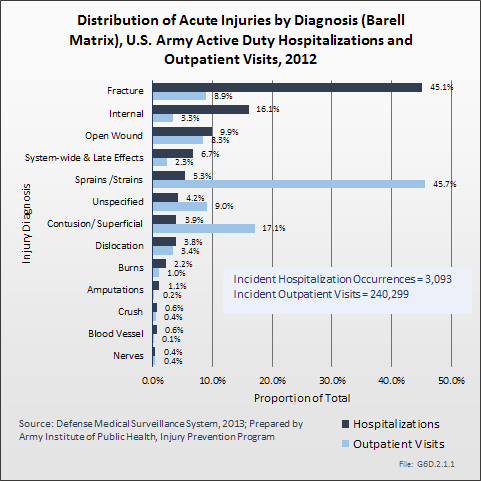 These two databases focus on hospital discharges (NIS) and visits to emergency departments (NEDS), and include millions of data points submitted by participating hospitals and emergency departments. 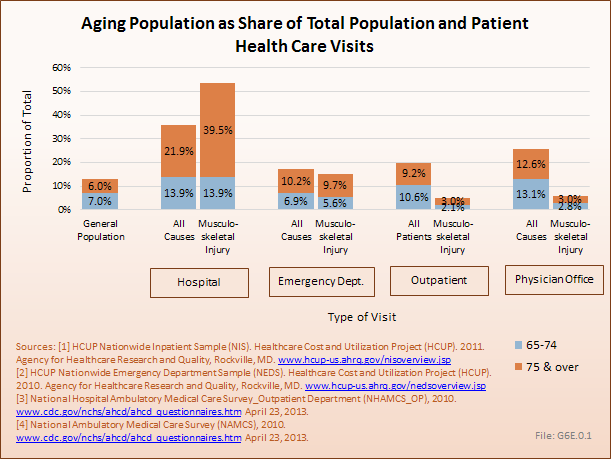 HCUP data is also weighted for representativeness of the U.S. population. 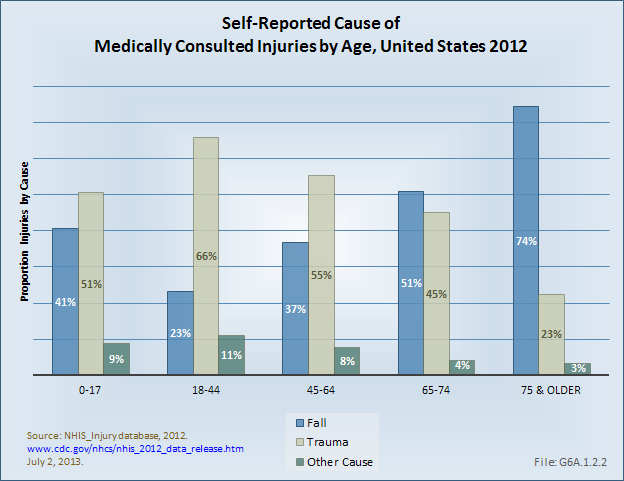 All databases are structured to provide only autonomous data. 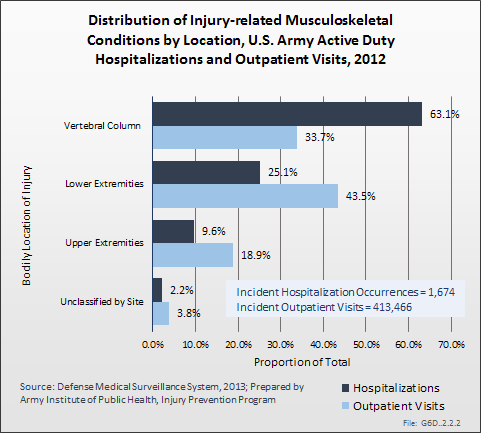 When the two databases were analyzed for hospital discharges and emergency department visits, they yielded similar results, supporting the validity of the findings reported.